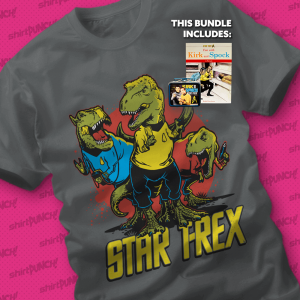 You look at this T-shirt and think “Oh, that’s cute, they’ve taken Star Trek and put dinosaurs in it to make a silly pun!” But I look at it and think “remember that one episode of Voyager where they met a race of dinosaurs that had a religion that didn’t let them believe that humans existed?” I like to think that the Voth advanced and evolved to the point where they started traveling the stars and created their own version of Starfleet. Maybe it would look exactly like this T-shirt. Or maybe not. Anyway, wrap this cloth around your torso to remind yourself of what could have been.